Apparently, houses stay up better with load bearing walls. Who knew? No, the house hasn’t collapsed and the beam didn’t drop on my head as I helped steady it though I had visions of an ER visit, split skull and concussion whenever it wobbled. Unsurprisingly, my husband did not ask for help even though I was sitting not ten feet away in the office and he could have called Silver earlier in the evening as Edie offered his assistance not once but twice in the same number of days this week. I had to insist a bit. Not because I enjoy helping. All things hoisting provoke visions of muscle tearing and ligament wrenching when it doesn’t simply make me fear for my safety in general. I offered because the grunting is scary and the thumps – alarming. By quarter to eleven – yes, that’s P.M. – one of new beams was in place and Dee, at least, was not likely to wake up in the former dining room. The dust had settled enough to vacuum, which was good because my skin itched even where there were no hives and my eyes, one of which had nearly swelled shut, felt as raw as my sinuses. This was not, perhaps, the best week to be scheduled for allergy testing as I am not allowed any antihistamines or cold medication. Fortunately, a yoga buddy clued me to the awesome power of gogi berry capsules. Two and my eyes were merely itchy as opposed to clamping shut. 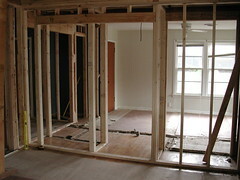 The beams replace the load bearing wall and should be up and secured by end of week – all six of them. After that the front room opens up to us again and we can begin making hurried preparations for Christmas. Rob’s family – blood and in-law – are converging from all directions, and I have a feeling that things will be Chinese curse equivalent at the very least. But one interesting moment at a time. This sounds like a friend whose husband, many years ago, starting taking apart the main bathroom in the house on Christmas Eve. For some reason he thought he and his father-in-law could get it back together in one day. When does that ever happen? Tell Rob it’s always good to have back-up. Good luck with the beams and opening up some space for guests over the holiday. you are correct. things always take much longer and I was fully aware of that when plans shifted from little kitchen remodel to basically building a new kitchen. I am neither surprised nor upset/dismayed. I am conscious of the time passing swiftly and the need to begin a bit of damage control to ensure xmas is not spent huddled in the child’s playroom. zoicks! that’s NOT a one-man job, despite the fact that he may have a process to execute it that way… a few extra hands wouldn’t hurt. then again, you could wait on the beams until all that family shows up – and put them to work? Actually, we cannot wait on people. The support braces are good but the load is heavy and the sooner the better for the new beams. Edie scolded a bit on my FB status, so Rob sent a note off to Silver this morning. 10th Anniversary of the Worst Supreme Court Decision Since Dred Scott.